France, 1804: Sophie Blanchard, a phobic young woman from the provinces, embarks on her first public balloon ascension with her husband, the pioneer aeronaut Jean-Pierre Blanchard. When Jean-Pierre takes a fall, Sophie must quickly learn to fend for herself. After a dramatic emergency landing, she creates a sensation with her desire to become the first professional female pilot. Jean-Pierre trains Sophie in the art of flight, but he suffers a fatal stroke and leaves her in dire straights. Saved only by her skill and passion, Sophie embarks on a solo career as an aerial performer. In these early years of flight, she quickly becomes an international celebrity for her daring hydrogen balloon ascensions. 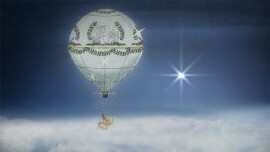 Napoleon Bonaparte names her the Official Aeronaut of the Empire, to the chagrin of her competitors. Even as the Empire crumbles, she rises to become the Official Aeronaut of the Restoration. After a dazzling career of fifteen years and 67 flights, Sophie will make the greatest sacrifice of all to stay in the air. History has all but forgotten Sophie Blanchard and her groundbreaking role as the first professional female pilot. Director Jen Sachs has traveled throughout France, Italy, and the United States to reconstruct Sophie Blanchard’s little-known story, conducting extensive independent research at various public and private archives, libraries, and museums including the Le Musêe de l’Air et l’Espace and La Bibliothèque Nacionale in Paris, the Smithsonian National Air and Space Museum and the Library of Congress in Washington D.C., and the Archiginnasio library in Bologna. The style of the film is scholarly and whimsical, a balance of empirical fact and visual allusion. Interviews with historians and experts in Europe and the U.S. act as storytelling portals, each offering a window onto Sophie Blanchard’s world. Key moments in Blanchard’s career are animated in a visual style inspired by early 19th Century “Caricatures Parisiennes,” reframing her within the context of her era. Motion graphics sequences featuring archival imagery build a framework for her story and provide insight into the politics, science, and culture of the period. The Fantastic Flights of Sophie Blanchard brings to light the story of an unknown aviation pioneer through the innovative form of the animated documentary. Visit the website for more information.